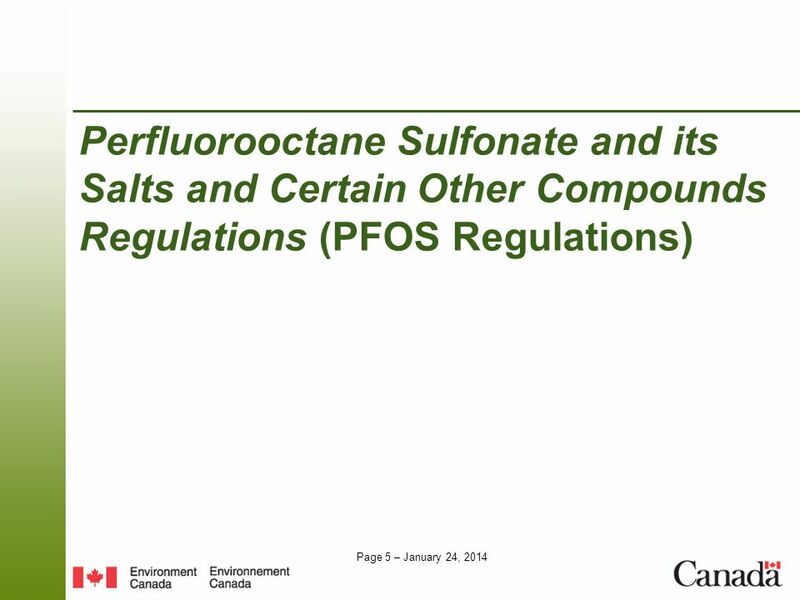 6 What is perfluorooctane sulfonate (PFOS)? 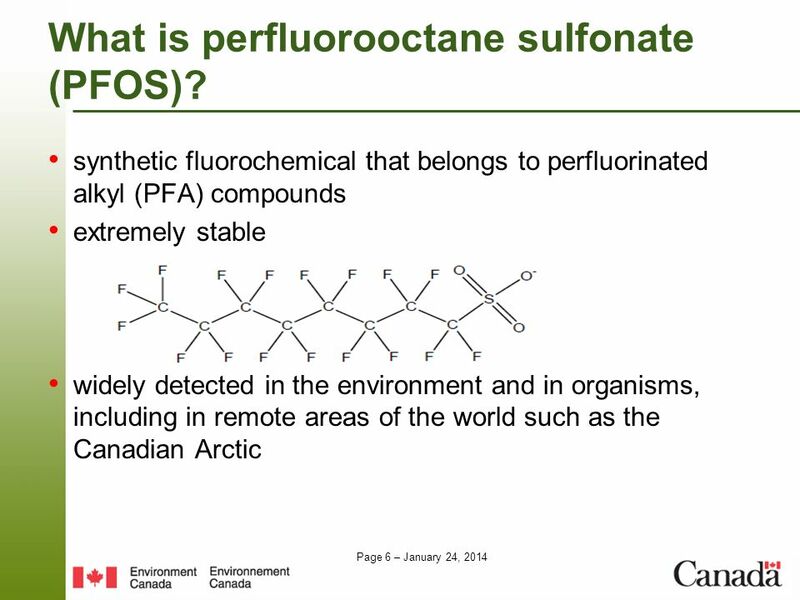 synthetic fluorochemical that belongs to perfluorinated alkyl (PFA) compounds extremely stable widely detected in the environment and in organisms, including in remote areas of the world such as the Canadian Arctic 1. 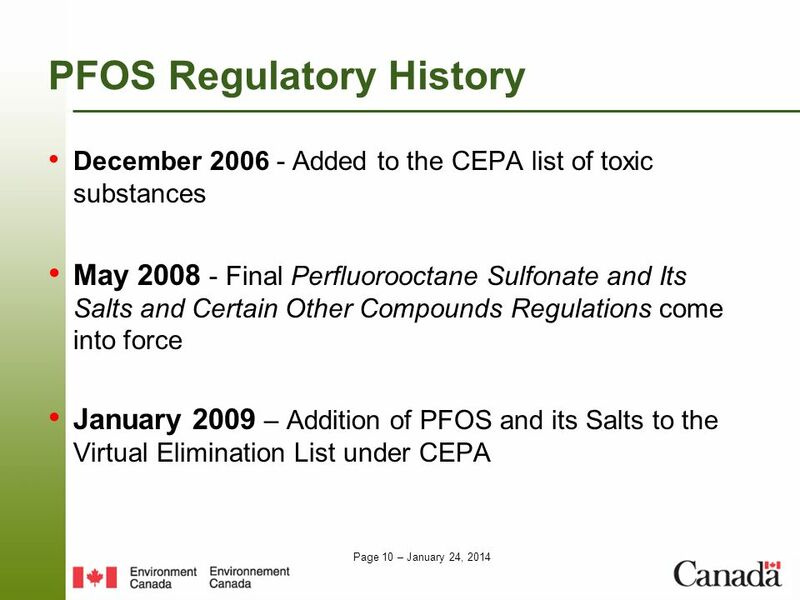 Subject to sections 2 and 3, these Regulations apply to the following substances that are specified on the List of Toxic Substances in Schedule 1 to the Canadian Environmental Protection Act, 1999: (a) perfluorooctane sulfonate and it salts; and (b) compounds that contain one of the following groups: C8F17SO2, C8F17SO3 or C8F17SO2N. 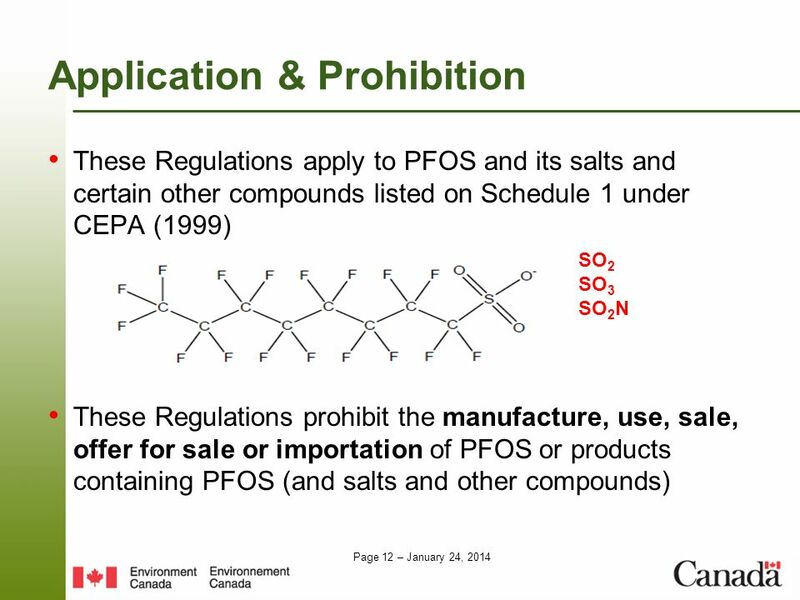 These Regulations apply to PFOS and its salts and certain other compounds listed on Schedule 1 under CEPA (1999) These Regulations prohibit the manufacture, use, sale, offer for sale or importation of PFOS or products containing PFOS (and salts and other compounds) SO2 SO3 SO2N C-F bonds extremely stable SO2O. 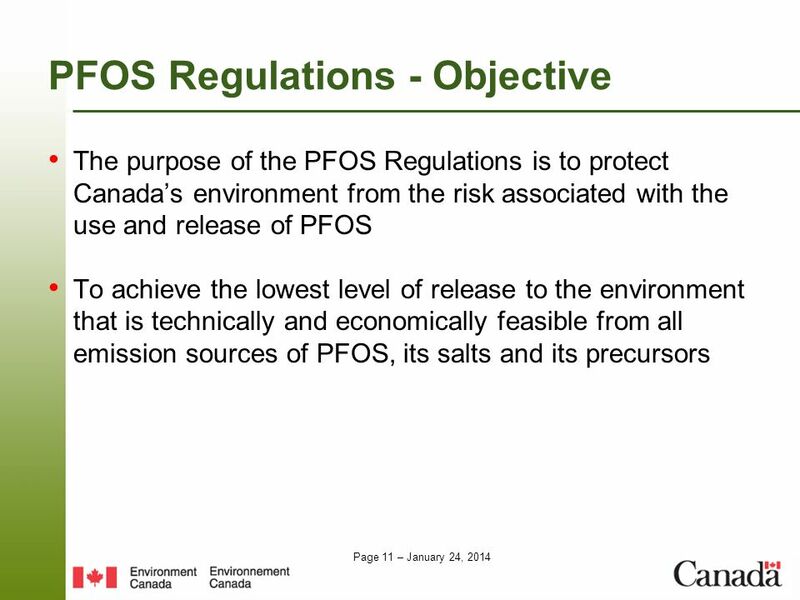 (sulfonate – PFOS anion); SO2 (sulfur dioxide); Means any of its anionic, acid or salt forms Potential to transform or degrade to PFOS 4. Subject to sections 5 to 7, no person shall manufacture, use, sell, offer for sale or import any substance referred to in section 1 or a product containing any such substance unless the substance is incidentally present. 1. 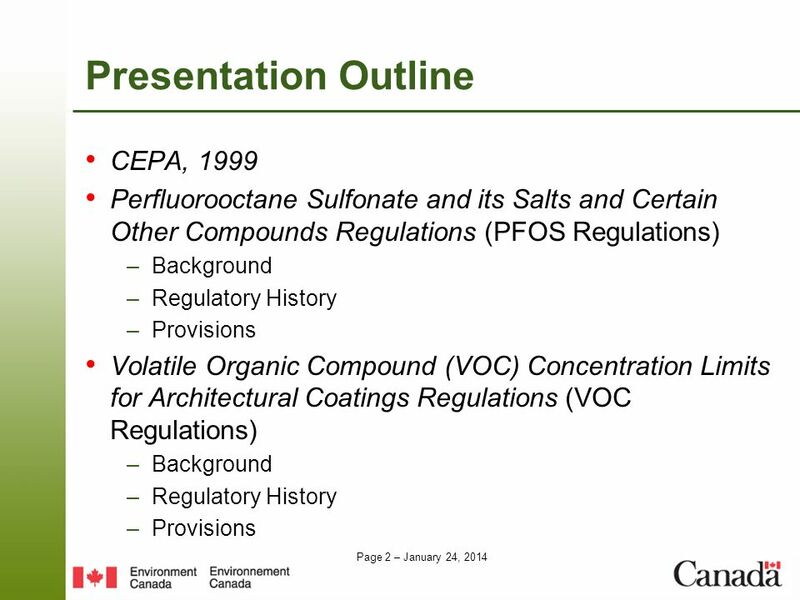 Subject to sections 2 and 3, these Regulations apply to the following substances that are specified on the List of Toxic Substances in Schedule 1 to the Canadian Environmental Protection Act, 1999: (a) perfluorooctane sulfonate and it salts; and (b) compounds that contain one of the following groups: C8F17SO2, C8F17SO3 or C8F17SO2N. 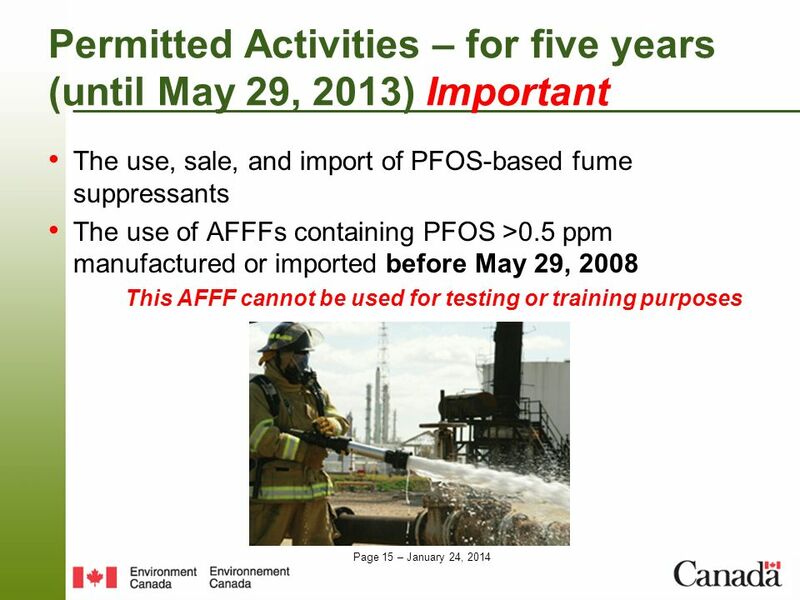 The use, sale, and import of PFOS-based fume suppressants The use of AFFFs containing PFOS >0.5 ppm manufactured or imported before May 29, 2008 This AFFF cannot be used for testing or training purposes Chromium electroplating; Chromium anodizing and reverse etching; Electroless nickel-polytetrafluoroethylene plating; Etching of plastic substrates prior to their metallization. 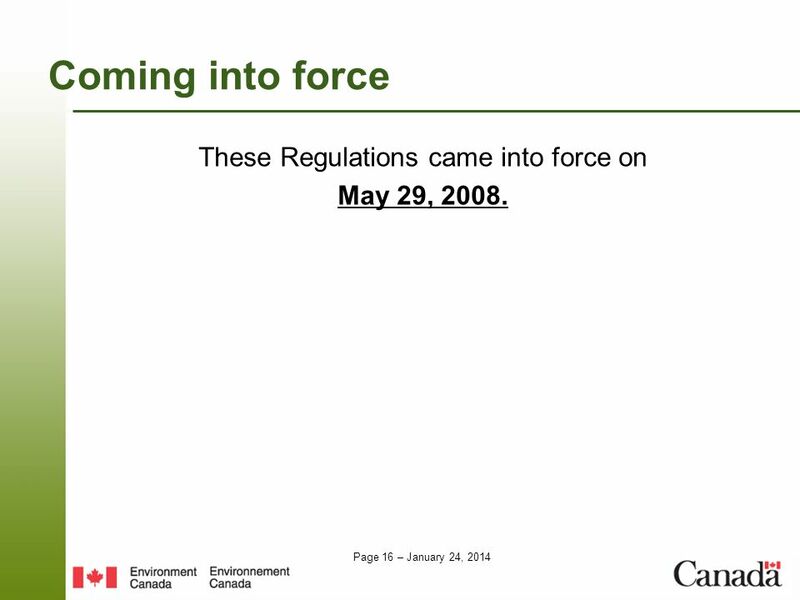 Coming into force These Regulations came into force on May 29, 2008. 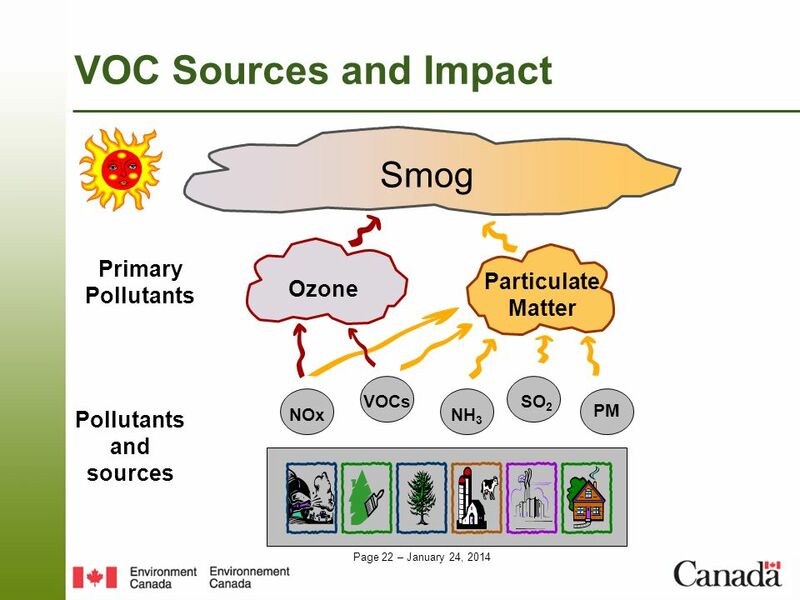 VOC Sources and Impact NOx Smog Ozone Particulate Matter VOCs NH3 SO2 PM Pollutants and sources Primary Pollutants This diagram outlines how smog is formed. The bottom of the diagram shows pollutants that contribute to the formation of smog. 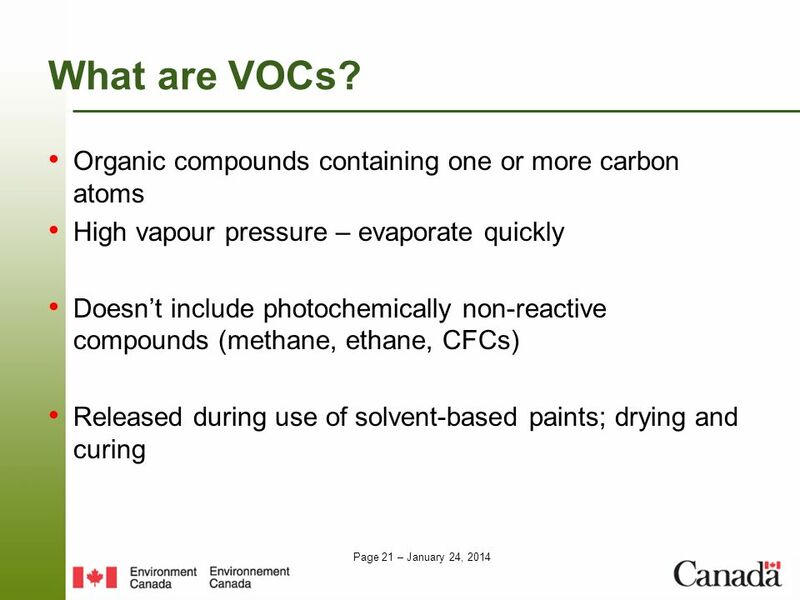 … this includes VOCs. 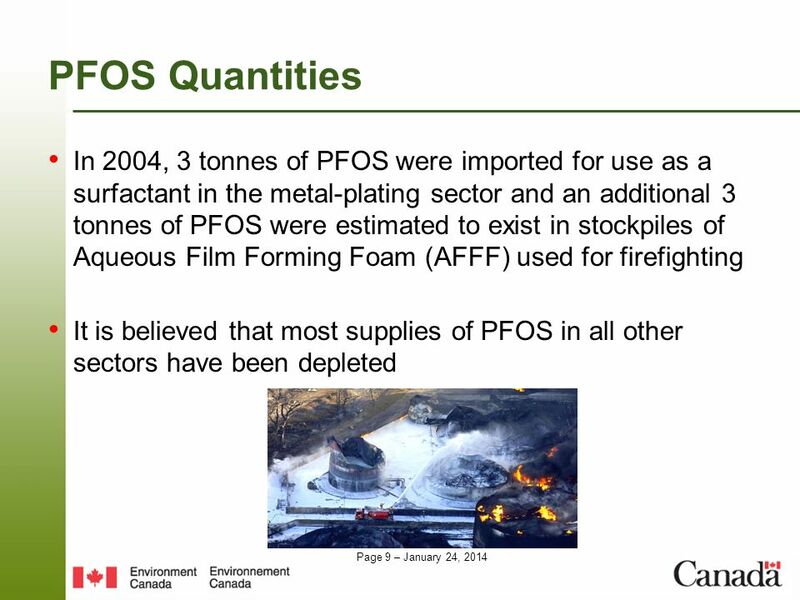 The sources of these pollutants include: Transportation (engines and fuels for on-road and off- road vehicles); use of paints and solvents; agriculture; industrial sources; and residential wood combustion. When released into the atmosphere, these pollutants (shown in grey circles) can react with one another in the presence of sunlight to form ozone, and contribute to the formation of particulate matter. 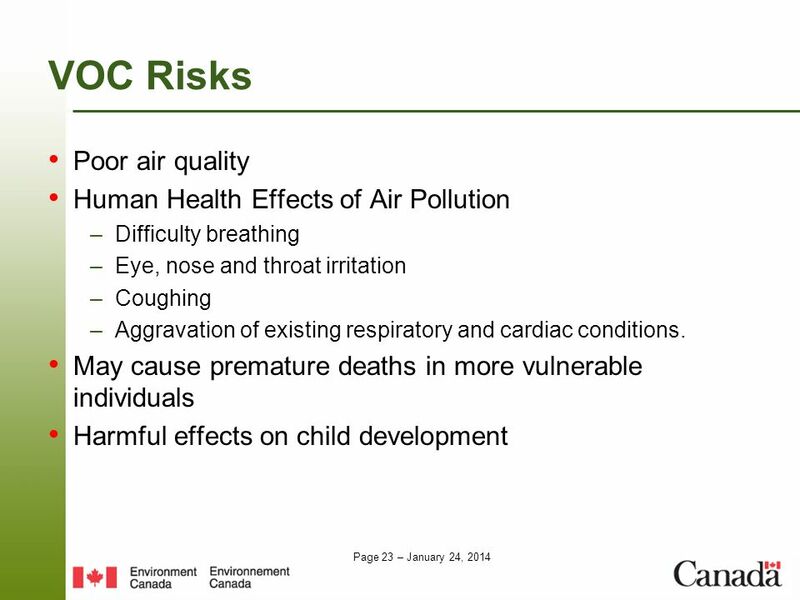 Ozone and particulate matter are the key ingredients of smog. 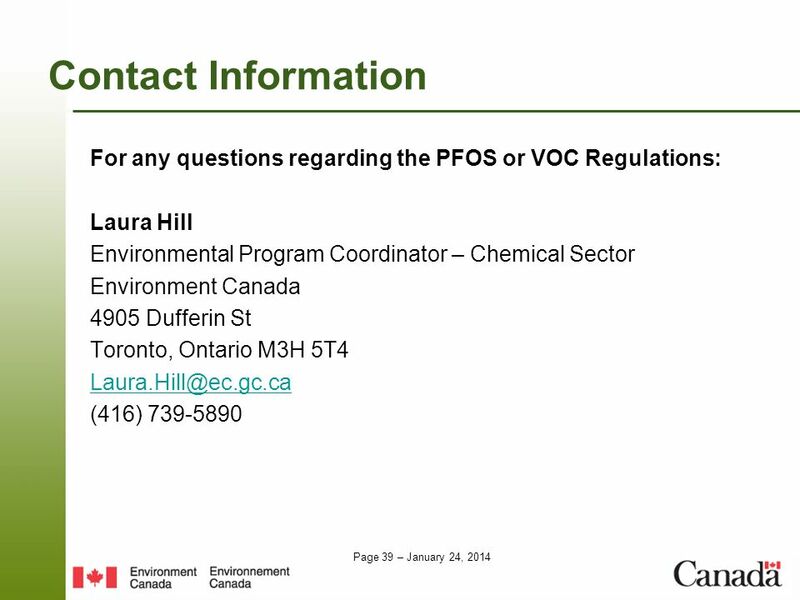 VOCs contribute both to the formation of ozone and particulate matter (secondary formation of PM2.5). Conditions that contribute to ozone formation include warm, humid and stagnant air (summer) Winter smog is mainly formed of PM and happens under cold conditions, when wood heating is more intense, in combination with a mass of stagnant air. traffic surfaces – such as streets and highways, curbs, berms, driveways, parking lots, sidewalks and airport runways; or, stationary structures –including temporary buildings– and their appurtenances, whether installed or detached. 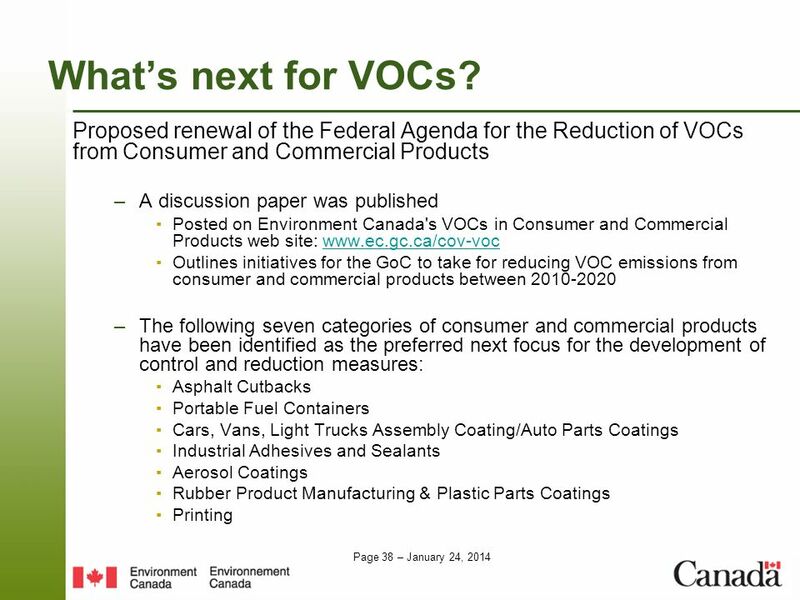 “VOCs” are as defined under item 65 in Schedule 1 of the Canadian Environmental Protection Act, 1999, with acetic acid, 1,1–dimethylethyl ester (tertiary butyl acetate) also considered an excluded compound. “Appurtenances” are attachments or accessories (of stationary structures). 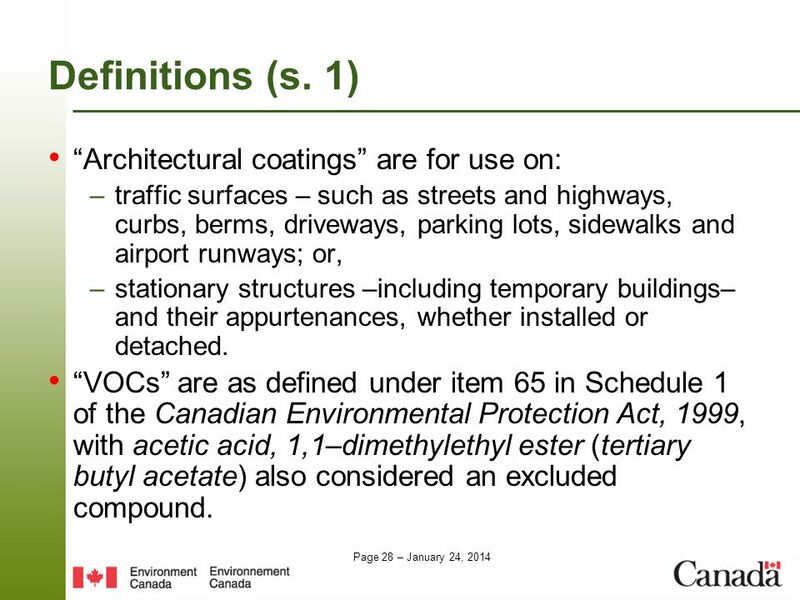 The definition for the term “architectural coatings” is in link with the next slide (scope of application), as it defines the types of coatings which are targeted. factory/shop application to a product or a component of a product, as part of a manufacturing, processing or repairing activity; scientific research; use as a laboratory sample or analytical standard; or, export or shipment to other persons for processing or repackaging. 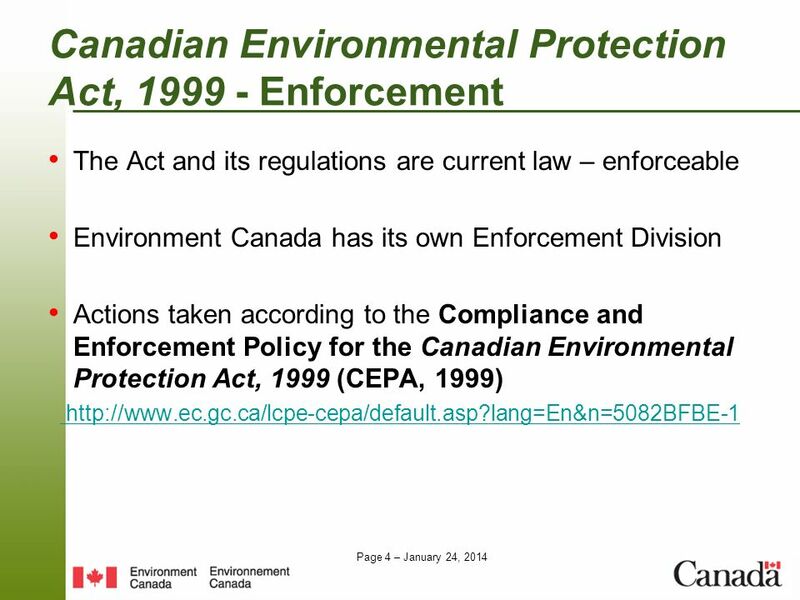 The regulations do not apply to: for application to a product or a component of a product, in or on the premises of a factory or a shop, as part of a manufacturing, processing or repairing activity; The control of VOC emissions from such coating applications has traditionally been undertaken by provinces/territories; and may, in addition, be controlled under future industrial initiatives of the Government of Canada’s Clean Air Regulatory Agenda (CARA). to be used in scientific research; to be used as a laboratory sample or analytical standard; The coating quantities used and the associated VOC emissions are very small, with little risk to the environment or human health. for export or for shipment to other persons for processing or repackaging. 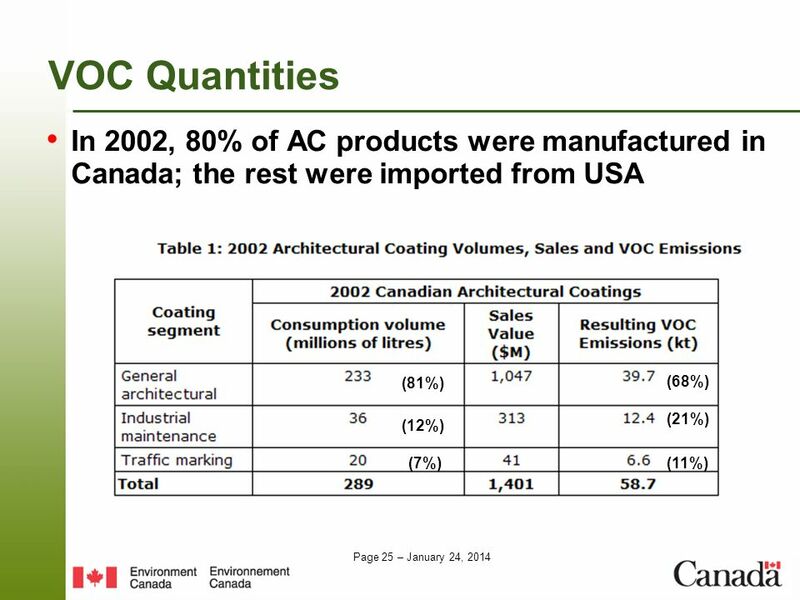 Architectural coatings for export will be subject to VOC requirements in the importing country adhesives; aerosol coatings; these VOC emission sources are expected to be addressed by separate control measures. 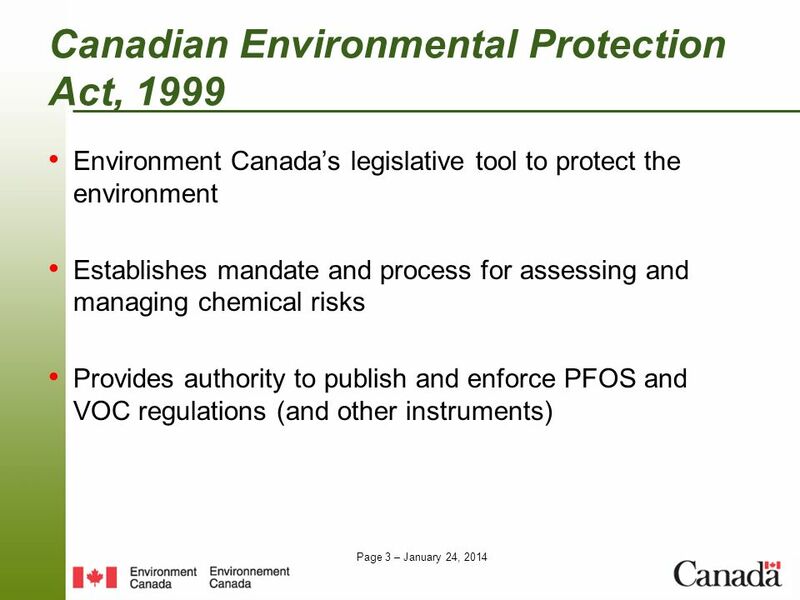 antifouling coatings; wood preservatives which are managed by Health Canada’s Pest Management Regulatory Agency (PMRA), and are regulated under the authority of the Pest Control Products Act. 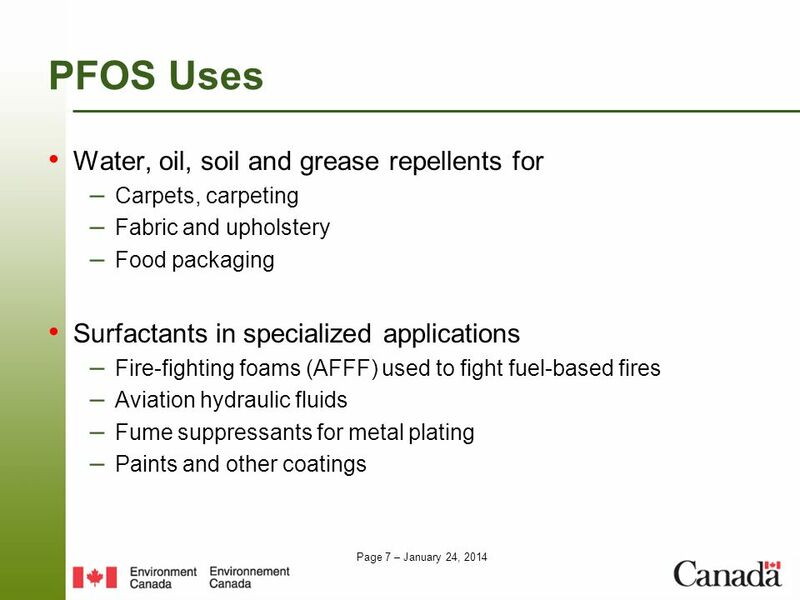 aerosol coatings; antifouling coatings; wood preservatives. 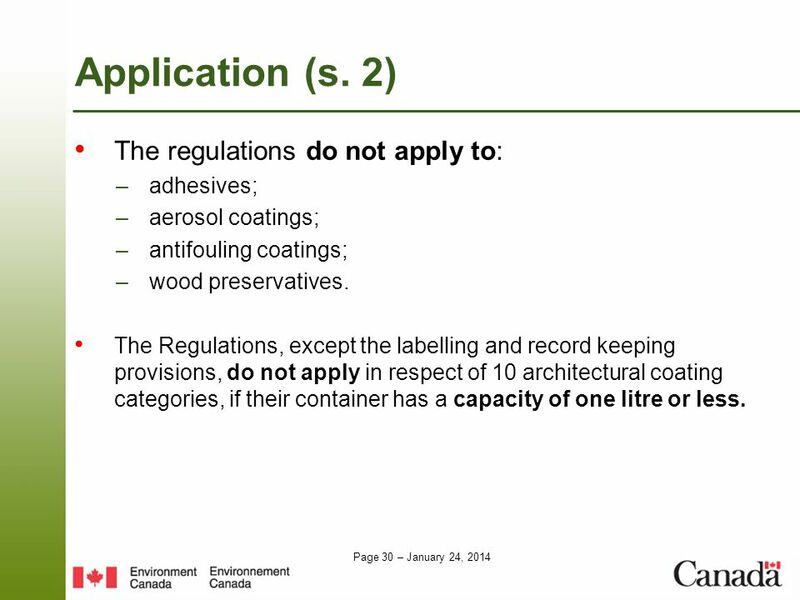 The Regulations, except the labelling and record keeping provisions, do not apply in respect of 10 architectural coating categories, if their container has a capacity of one litre or less. 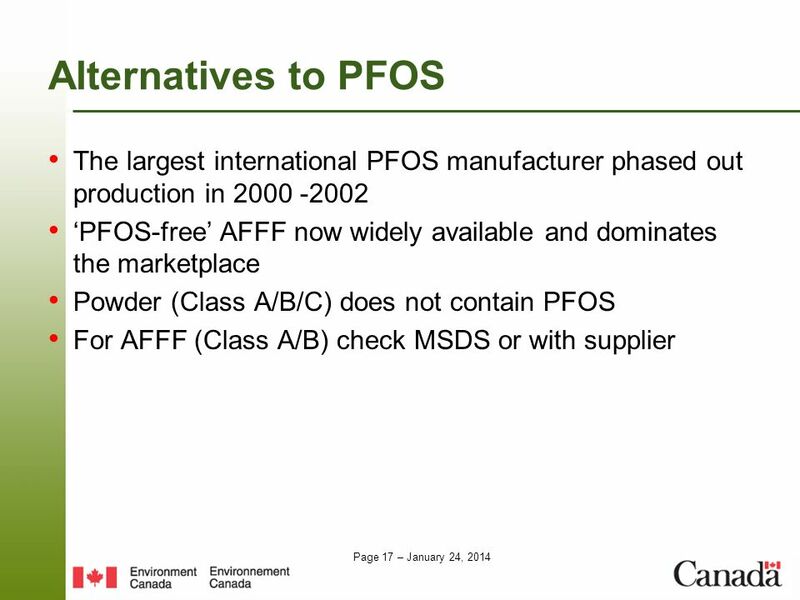 In parentheses, Item number from the Schedule of the Regulations Small container exemption Environment Canada confirmed that a small container exemption would allow the continued manufacture of niche and specialty products. 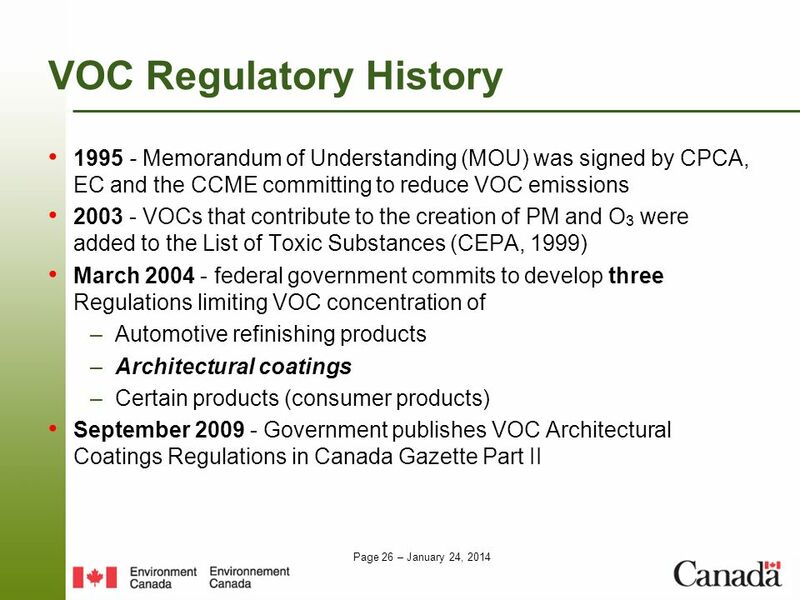 The proposed Regulations therefore provided a small container exemption for eight architectural coating categories. 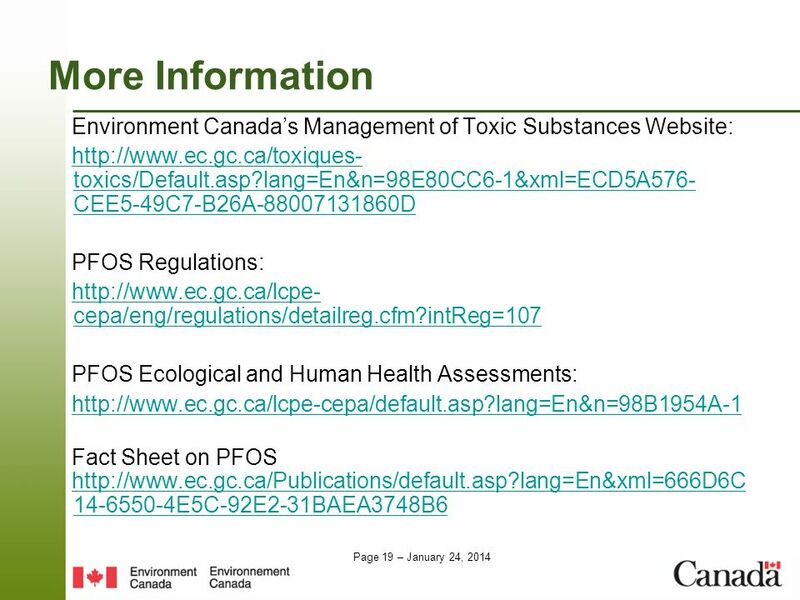 Technical information collected during the development of the proposed Regulations indicated that these categories contain niche products with low volumes of use and emissions and for which no compliant alternative formulations are believed to be available. 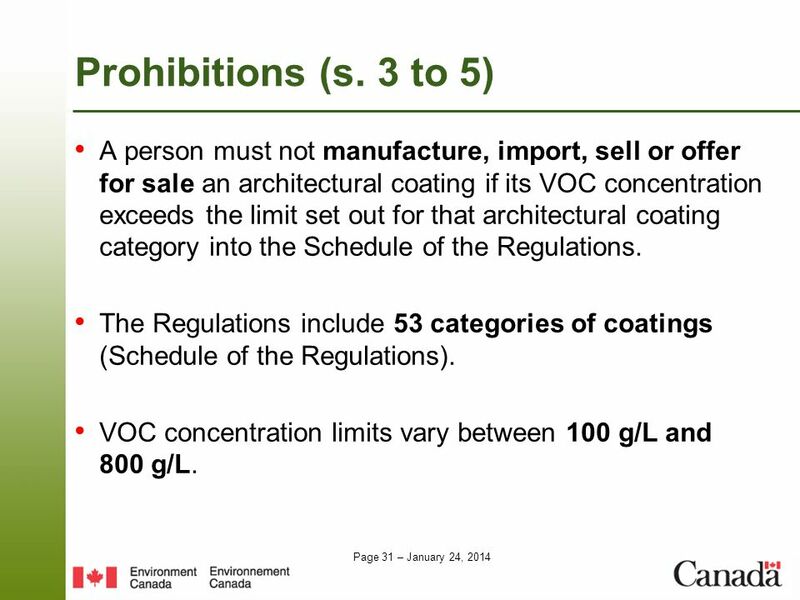 31 Prohibitions (s. 3 to 5) A person must not manufacture, import, sell or offer for sale an architectural coating if its VOC concentration exceeds the limit set out for that architectural coating category into the Schedule of the Regulations. 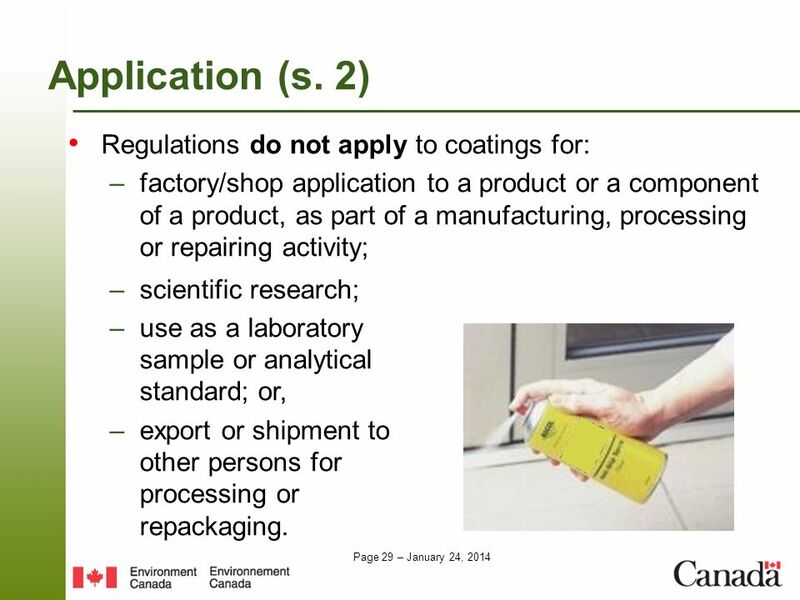 The Regulations include 53 categories of coatings (Schedule of the Regulations). 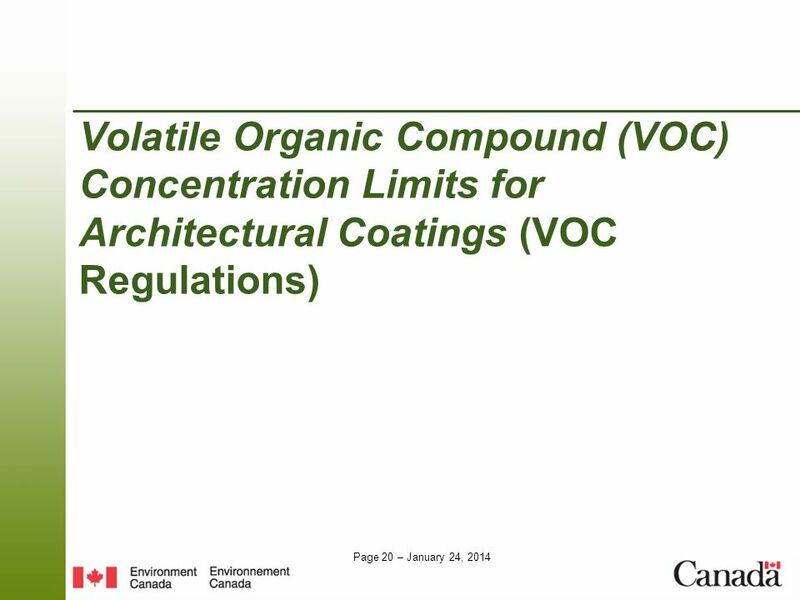 VOC concentration limits vary between 100 g/L and 800 g/L. 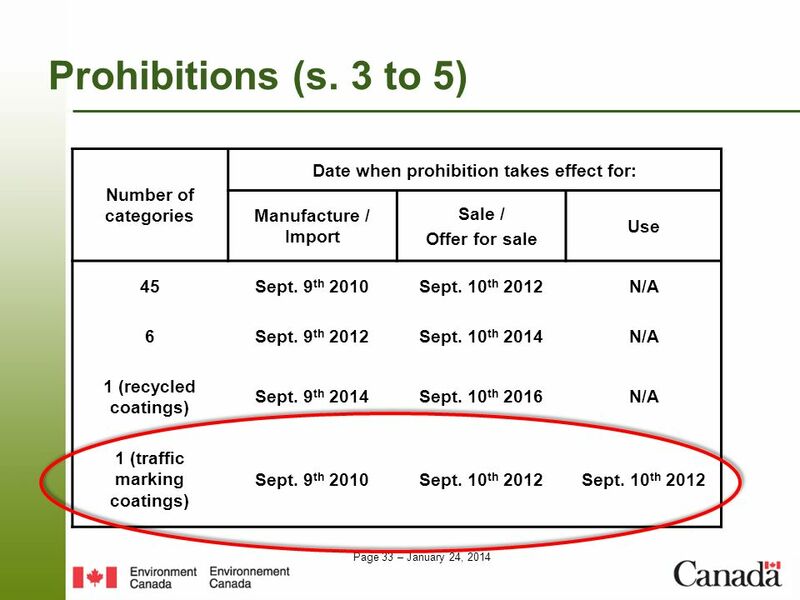 Traffic marking (TM) coatings constitute the only category also subject to a prohibition on the use as of September 10, 2012: From May 1st until October 15th, it is prohibited to use a TM coating if its VOC concentration is above 150 g/L. 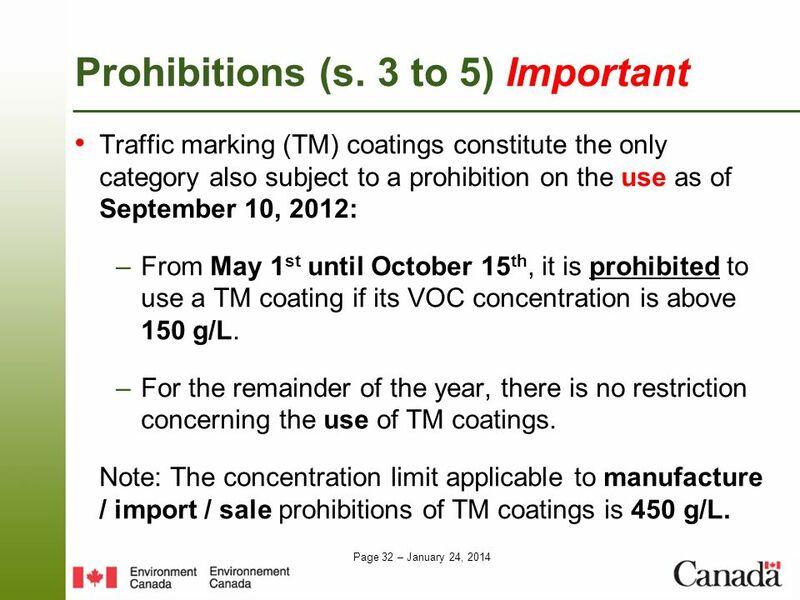 For the remainder of the year, there is no restriction concerning the use of TM coatings. 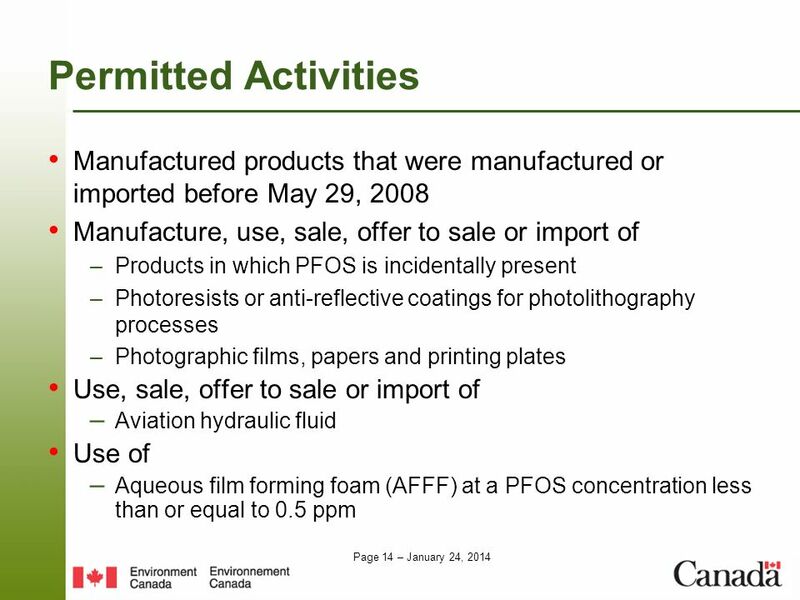 Note: The concentration limit applicable to manufacture / import / sale prohibitions of TM coatings is 450 g/L. 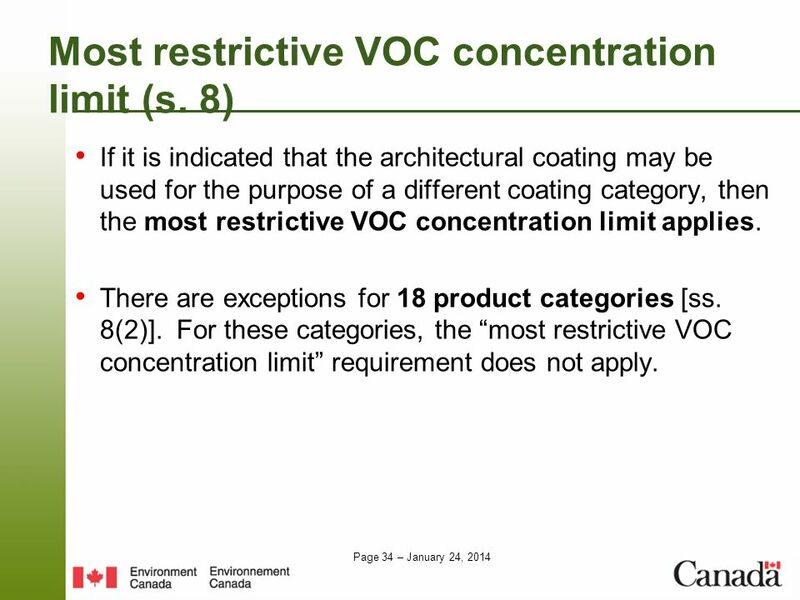 If it is indicated that the architectural coating may be used for the purpose of a different coating category, then the most restrictive VOC concentration limit applies. There are exceptions for 18 product categories [ss. 8(2)]. 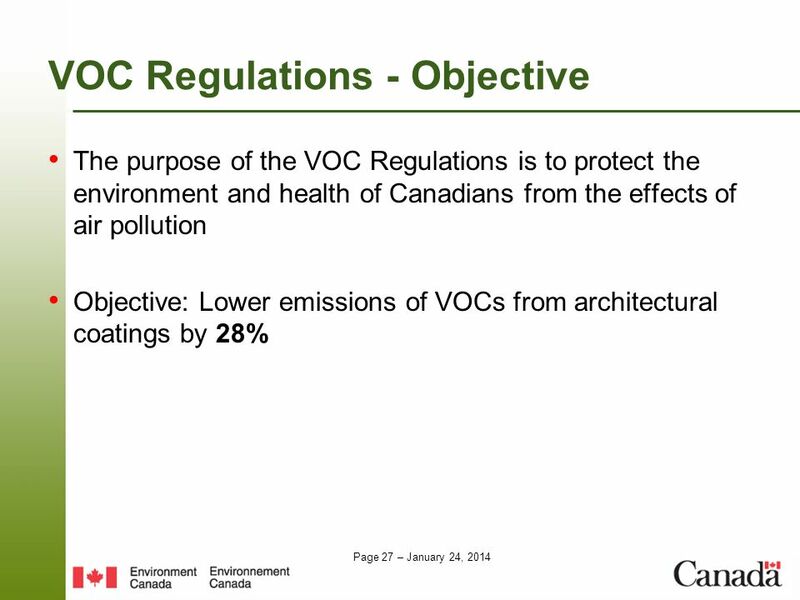 For these categories, the “most restrictive VOC concentration limit” requirement does not apply. 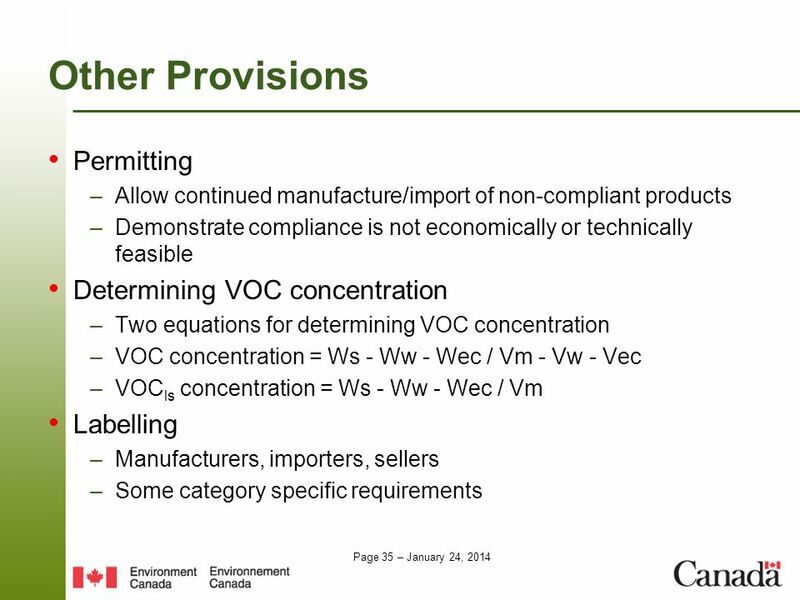 Allow continued manufacture/import of non-compliant products Demonstrate compliance is not economically or technically feasible Determining VOC concentration Two equations for determining VOC concentration VOC concentration = Ws - Ww - Wec / Vm - Vw - Vec VOCls concentration = Ws - Ww - Wec / Vm Labelling Manufacturers, importers, sellers Some category specific requirements VOC concentration is the VOC concentration of an architectural coating, in grams of VOC per litre of coating; Ws is the weight of volatiles, in grams; Ww is the weight of water, in grams; Wec is the weight of excluded compounds, in grams; Vm is the volume of architectural coating, in litres; Vw is the volume of water, in litres; and Vec is the volume of excluded compounds, in litres ___ VOCls concentration is the VOC concentration of a low solids (ls) coating, in grams of VOC per litre of coating low solids coating (i.e. 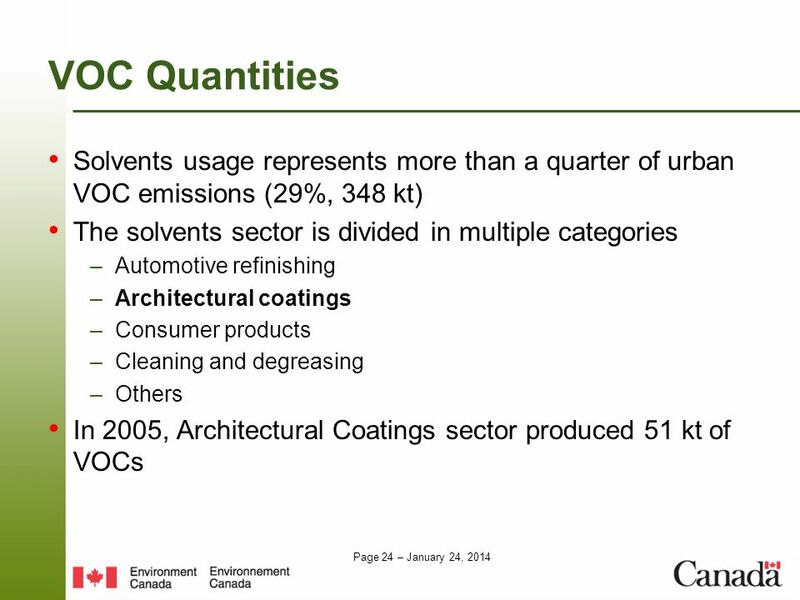 containing 0.12 kg/L of solids or less), Ws is the weight of volatiles, in grams, Ww is the weight of water, in grams, Wec is the weight of excluded compounds, in grams, and Vm is the volume of architectural coating, in litres. 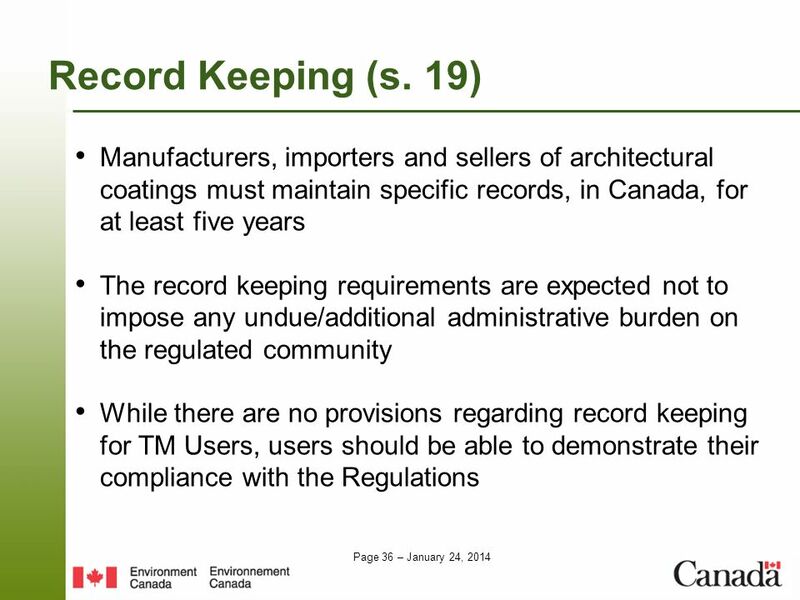 36 Record Keeping (s. 19) Manufacturers, importers and sellers of architectural coatings must maintain specific records, in Canada, for at least five years The record keeping requirements are expected not to impose any undue/additional administrative burden on the regulated community While there are no provisions regarding record keeping for TM Users, users should be able to demonstrate their compliance with the Regulations Provisions defining record keeping requirements are included to facilitate compliance and enforcement of the Regulations. Record keeping requirements specify the type of information required to determine compliance with the Regulations. 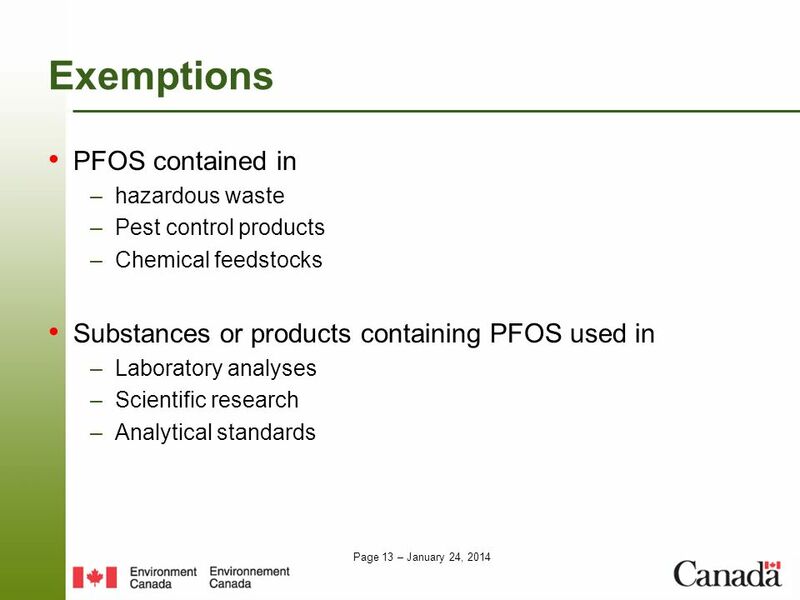 The requirements also define the records that are most relevant for demonstrating compliance (e.g. 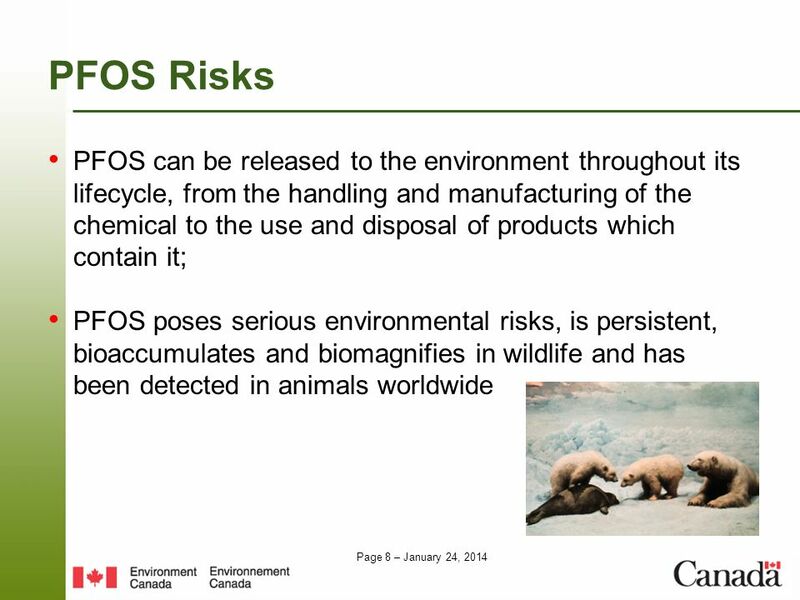 quantity of product manufactured, imported or sold and date) and the information that must be retained in Canada to ensure that Environment Canada’s enforcement officers have access to the records. 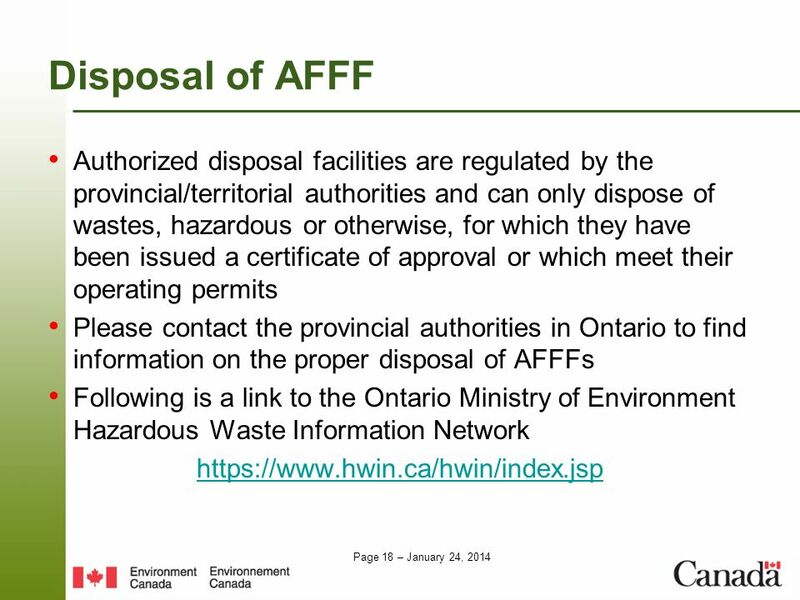 The same information should already be kept under others Acts and regulations. Therefore, it is expected that the record keeping provisions will cause no additional administrative burden for the regulated entities. 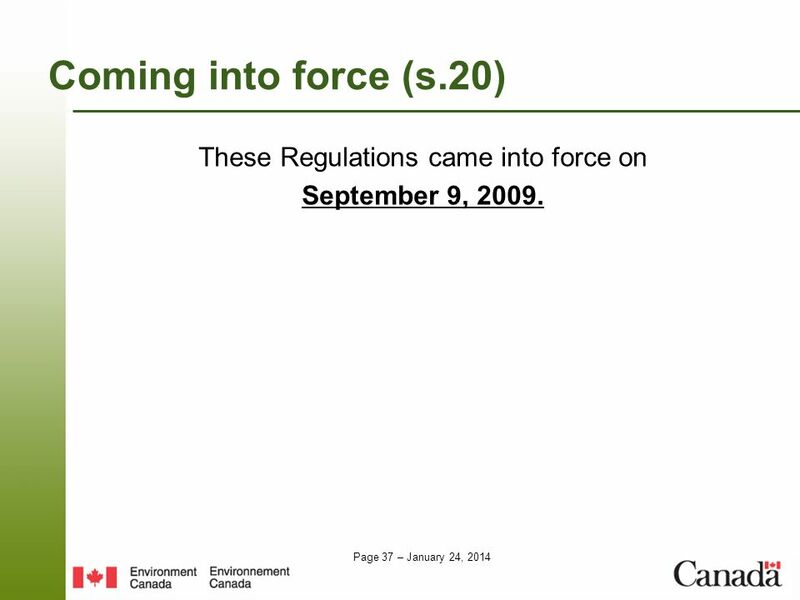 Coming into force (s.20) These Regulations came into force on September 9, 2009. 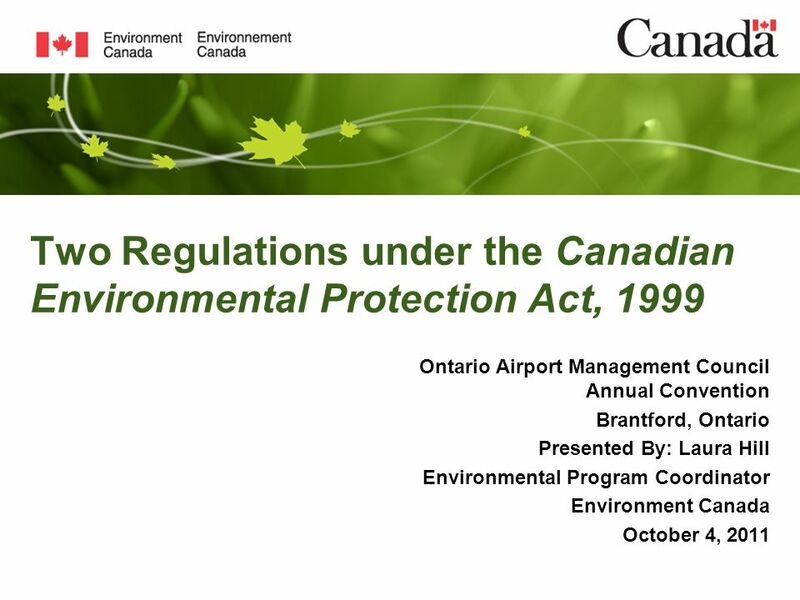 Download ppt "Two Regulations under the Canadian Environmental Protection Act, 1999"
14 th September Life Cycle Assessment of biomethane public transport Jan Paul Lindner Dept. Life Cycle Engineering (GaBi) Chair of Building. Water Testing 1 Water Testing: How we measure what you cant see 1 st Elmvale Water Festival August 4, 2007 Ray Clement Laboratory Services Branch, Ontario. Mr. ALI GORKEM & Mr. BURAK KEMERCI MARITIME EXPERTS PRIME MINISTRY UNDERSECRETARIAT FOR MARITIME AFFAIRS Ship Recycling Technology & Knowledge Transfer. The Legal Foundation TRICARE Management Activity HEALTH AFFAIRS 2009 Data Protection Seminar TMA Privacy Office.